Again, thank you for writing back and helping me with my lifetime dream. TJ, I would like to buy one of you dance music CDs (one with some outstanding drum beats); which one do you recommend? one which you are the proudest to have produced because it was the hardest and most complicated CD to produce both musically and technically? I would like to use that CD as inspiration and as a goal to reach with my music productions. That's a tough one. My latest CD - Heartwashed - was the hardest for me to produce both musically and technically. I was aiming for a whole collection of songs featuring the piano against the violin - sometimes complimenting each other, other times countering one another. I'm very happy with the results and I feel this collection has some of my best work to date. Not many "dance" tracks on this CD, though. I have a couple that could fit in the Dance/Trance realm, some for the RnB genre, one for Hip-Hop and the rest are just "Moody" and could fit into several genres. 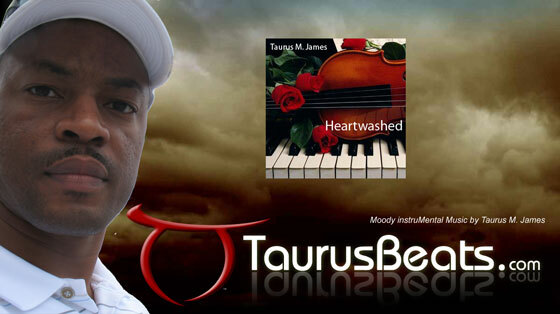 The Heartwashed collection is my favorite and I suggest you check it out online at my site (taurusbeats.com). Then, browse my online music catalog. I've got plenty of tracks there and I'm sure you'll find some that inspire you. Here's a link to some "Playlists" created by me and some other site visitors. Click the "Taurus Dance Music" link and listen to the songs. Then tell me which ones you like and want to buy. I did it this way because not all of my ready-made CDs have just dance music. But you can order "custom" CDs from me and I'll put on the CD the tracks you want in the order you want. Custom CDs are $10 for any 15 songs and you'll get the CD in the mail within 3-5 business days. Of course, you can buy the MP3 versions online. Just go to the "Music" page, search for the song(s) you want and click the gold "cart" image to add the songs to your shopping cart. Then, make your payments with any major credit card using Paypal. You're welcome to the knowledge I've gained through experience. Again, I appreciate you and your interest in what I do. I'm more than happy to help you.